Giovanni Cabrera Mioletti couldn’t have asked for a better start to the New Year. 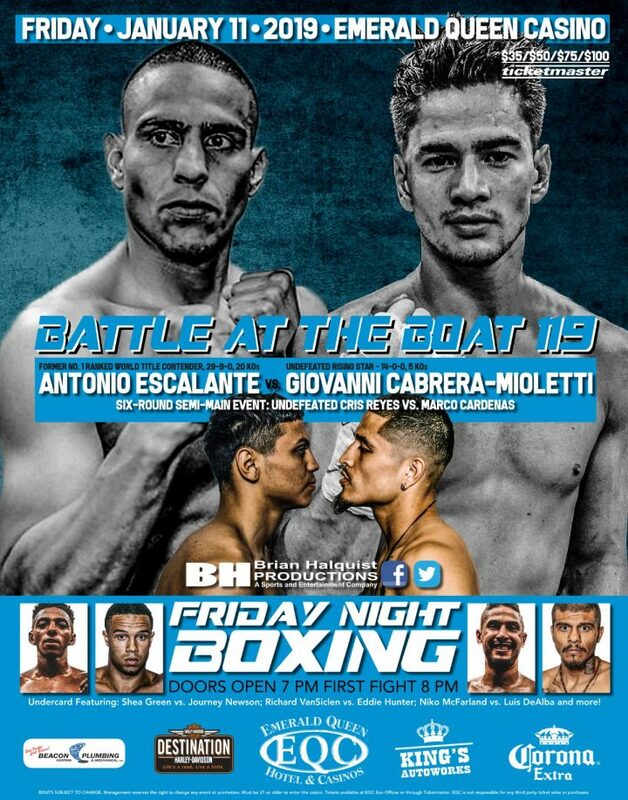 The fast-rising super featherweight remained undefeated after knocking out former world title contender Antonio Escalante midway through the third round of their Battle at the Boat 119 main event on Friday at the Emerald Queen Casino in Tacoma, Wash.
Cabrera Mioletti improved his record to a perfect 15-0-0 after registering his sixth career KO. After an even first round, Cabrera Mioletti began to take control of the scheduled 10-round bout, using his quickness and speed to keep Escalante (29-10-0, 20 KOs) off balanced. Mioletti Cabrera produced the fight’s first knockdown late in the second round, a flash knockdown which sent Escalante to one knee. The second knockdown was much more vicious as Mioletti Cabrera caught his opponent was a quick right which caught Escalante square on the jaw. The blow briefly dazed Escalante, who wobbled on his feet before crashing to the canvas. A glassy-eyed Escalante was able to beat the count, but he was in no condition to continue, leading to the TKO. Cabrera Mioletti wasn’t the only fighter to remain undefeated on the card as light heavyweight Richard Van Siclen improved to 6-0-0 with a unanimous decision(40-35, 40-35, 40-34) over veteran Eddie Hunter. Van Siclen’s teammate Shae Green (3-0-1) also triumphed on the undercard, defeating fellow 140-pounder Journey Newson by split decision (38-37, 37-38, 38-37). Also picking up victories were Niko McFarland, Derick Bartlemay and Luis Iniguez.